The New. The Next. The Never Before. 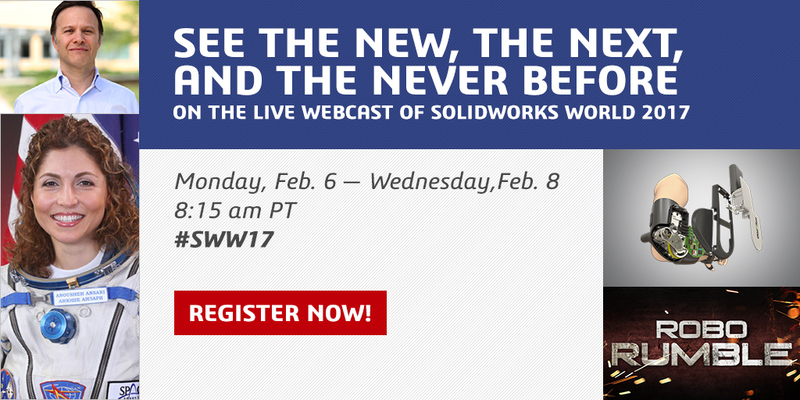 It’s February and SOLIDWORKS WORLD 2017 is just around the corner! SOLIDWORKS World is a greatest CAD event of the year. It is a great place to learn new skills, network with peers and get inspired to create great designs. This year, the future is the concept of SOLIDWORKS WORLD. Not just the future of SOLIDWORKS capabilities, but what’s coming in the design industry itself. We feel that by providing you with a more connected, collaborative, and efficient way of designing, we are helping you usher in the next generation of amazing products and innovations to change the world. SOLIDWORKS World 2017 will show you the future. New ways to close the gap between design and manufacturing. Enabling machines to better read minds and fully understand designs. This will minimize mistakes and create a continuum to mend the fracture between design and manufacturing. Transforming the manufacturing process to become more like the buying experience on Amazon. Smart machines will read and understand work, then provide access to information on quality, delivery time, and cost. This approach represents how we envision the future of transforming bits to atoms in SOLIDWORKS. We need to improve the “A” in Computer-Aided Design. The assembly process must be smarter and faster with computers that actually “aid” by providing intelligent suggestions based on the power of analytics and big data. We must focus on providing more guidance in geometry. The best alternatives of new ways to manufacture. This year’s SOLIDWORKS World 2017 will be held February 5-8, 2017 at the Los Angeles Convention Center in Los Angeles, CA. SOLIDWORKS community members all over the globe including us are excited and are gearing up for this great event. WE will be attending SOLIDWORKS WORLD 2017 and share all stunning moments with our dearest readers. So, stay tuned for important SOLIDWORKS WORLD 2017 event updates and live updates through our Facebook SolidWorks Malaysia - IME Authorized Reseller.